Happy Holiday Railway Santa Trains! 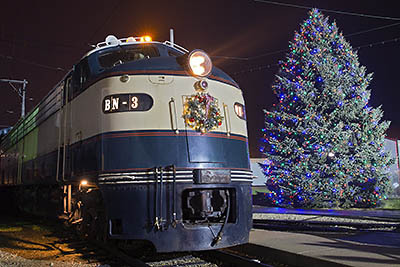 Illinois Railway Museum invites you to Embark on a magical train ride through the winter countryside on your way to visit with Santa Claus himself! Warm treats will be served and gifts will be given to everyone on Santa’s “good list”. IMPROVED FORMAT FOR 2016 – longer train ride, easier boarding, Santa Claus riding along on the train with you! Start a new Christmas tradition with your family this year! Purchase tickets online now! or Visit Their Website for more information. Days for this event are November 26th, 27th, December 3rd, 4th, 10th, 11th, 17th, and 18th. Saturday trips are hourly from 2pm to 7pm and Sunday trips are hourly from 1pm to 6pm. (Rides at other times may be opened up at a later date based on demand).